Past the brick rowhomes that have come to define Baltimore, Emmanuel Episcopal Church, established in 1854, sits on the corner of Read and Cathedral Streets. At street level, only the abrupt appearance of rubble stone from brick indicates that there is a new building at all. That is, until the lucky passerby looks up. Towers soar above a progress of granite to white limestone, punctuated by lancet windows and tempered with light refracted through stained glass windows. 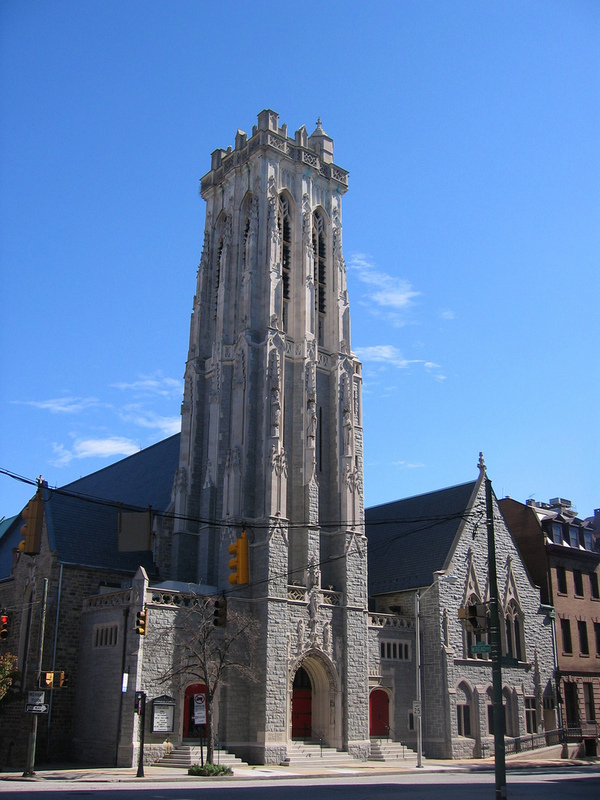 A striking example of Gothic architecture in Baltimore, the church was designed by Niernsee & Neilson (the same partnership behind the Green Mount Cemetery Chapel and Clifton Mansion.) The towers and archways invoke a time long past, of feudalistic morality and rigid social structures of the separation of the few from the struggles of the many... and yet, it was these very towers that looked down upon one of the twentieth century's most controversial and feminist writers, Edna St. Vincent Millay. She spent the next two years in Europe writing for Vanity Fair, producing upon her return the work that would win her the Pulitzer, The Harp Weaver and Other Poems (1923). In this and her other works, in a time when women still were fighting for the right to vote in much of the United States, Millay championed the plight of women and the oppression of traditional gender roles. She loved freely, marrying Eugen Boissevain in 1923 on the understanding that she would not be faithful, and let him manage her tours. It was on one of her tours that Mrs. Sally Bruce Kingsolver asked her to read at the Emmanuel Episcopal Church for the Poetry Society of Maryland. What poems she read is not recorded but she surely read with the passion of one who rubbed so far against the grain. She was the absolute embodiment of the hedonism of the 1920s, as she did what she wanted, defied convention at every turn, and presented herself to life with a passion that swept up those around her. Elizabeth Matthews, “Edna St. Vincent Millay at Emmanuel Episcopal Church,” Explore Baltimore Heritage, accessed April 23, 2019, https://explore.baltimoreheritage.org/items/show/168. Robert L. Gale, "Edna St. Vincent Millay's Life" from the Modern American Poetry Site. Published on Nov 27, 2012. Last updated on Nov 27, 2018.